Clear your calendar - It's finally here! 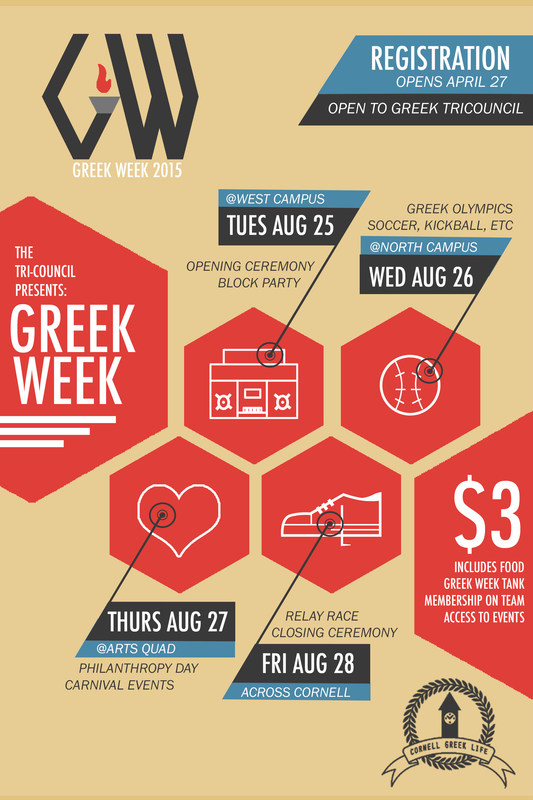 Cornell Greek Week 2015 kicks off on August 25th, and you're invited to take part in the festivities. Although pre-registration has closed, you can still LATE REGISTER for $3 on Tuesday August 25th 4pm-6pm at the Greek Week Block Party to secure free food, membership on a team, a Greek Week Tank, and access to events such as Greek Week Block Party, Greek Olympics, the Greek Philanthropy Carnival, etc. Encourage your chapter to register today! Share the details, this will be a week not to forget.